There are three different ways you can offer protection for your products. You can turn on one or all of them. Manage this on your "Customize" page. 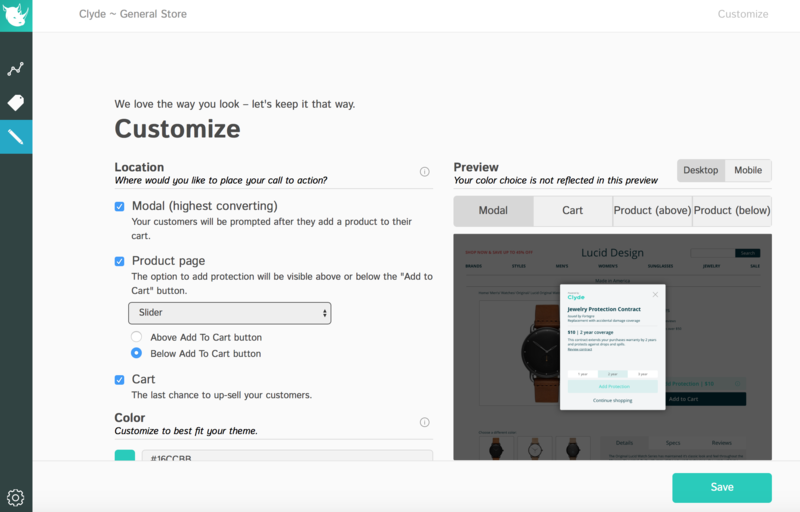 After a customer adds a product to their cart, a modal will pop up asking if they would like to add protection to their purchase. They have the option to add it to the cart, continue shopping, or close the modal. This is the highest converting format and drives the most passive revenue. The option to purchase protection will be displayed passively on the product page. This exists as a variable and can be added above or below the "Add to Cart" button. This is the last chance to up-sell your customers. This CTA lives in your cart, much like adding gift wrapping, and allows customers to add protection right before checking out.